From North and West Vancouver, Horseshoe Bay Ferry Terminal, taxi service to Vancouver International Airport ( YVR) or Seattle’s SEA-TAC International Airport is a simple and stress-free call to Sunshine Cabs. Like any piece of motherly advice, if you intend to travel during the busy rush hour periods, please ensure you give yourself plenty of time before your flight departs. 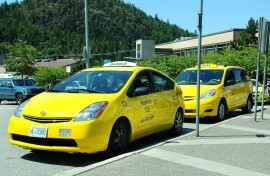 On the way back, don’t forget all of our 68 Sunshine Cabs are also licensed to pick you up at the airport too! Just let the Ground operations at the taxi stand know you would like a “North shore Sunshine Cab please” (we maintain a portion of our fleet directly at the airport too) and it will be immediately arranged to take you anywhere you wish to go, giving you one less thing to worry about.